Anglicare Victoria’s Gambler’s Help team are encouraging people to find out about the effects of gambling and the local support available during Gambling Harm Awareness Week. The team will participate in the Victorian Responsible Gambling Foundation’s inaugural Gambling Harm Awareness Week (October 8 – 14) and host a luncheon forum where community and family services from across the Loddon Mallee area can talk about the issue of gambling harm, share personal experiences of harm and support those currently affected by harm. So far this year, the Bendigo Gambler’s Help team have helped 430 people experiencing gambling harm, an increase of 23 per cent from the same time last year. During 2017-18 the City of Greater Bendigo spent $49,335,224 on pokies, or $315,165 per day, an increase of $1,581,096 from 2016-17. Anglicare Victoria Regional Director Francis Lynch said the use of poker machines in the Loddon Mallee region was concerning and encouraged people in need of support or worried about family or friends to call the team. 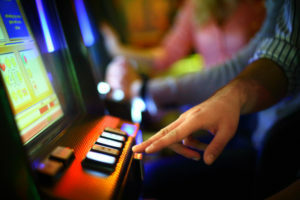 “The continuing increase in pokies losses in our region, and the sheer speed at which people can lose money on the machines, is a great concern,’’ he said. “Our Gambler’s Help team is also are finding that due to the easy access of betting apps, internet and phone sports and racing betting is increasing losses for these forms of gambling. “Gambling Harm Awareness Week is a great opportunity for people to not only gain knowledge of gambling related harm, but also to learn about the services available for those who may be experiencing the effects of gambling harm or be concerned about a family member or friend,’’ he said. Mr Lynch said that harm from gambling could affect anyone, even those who don’t gamble, such as the family and friends of people who do and could escalate quickly and that support is available. “There are many ways for people experiencing gambling harm to receive help – it isn’t always necessary that people need to see the Gambler’s Help team face-to-face. The team are trained to support people from our local service via phone or email,” he said. The event is one of more than 50 activities funded by the Victorian Responsible Gambling Foundation that will take place across the state between 8 and 14 October under the theme TALK. SHARE. SUPPORT. Together let’s prevent gambling harm. Room 3), 10 Mundy St, Bendigo.